I bought some Reflections (d842) while I was in Auckland. Having won a box of cups and saucers in this Reflections pattern on trademe on Saturday morning I then returned to Henderson's Habitat shop to pick up the 3618 coffee cans I walked away from on my last visit to Auckland, in the hope that I might get some shape matches. 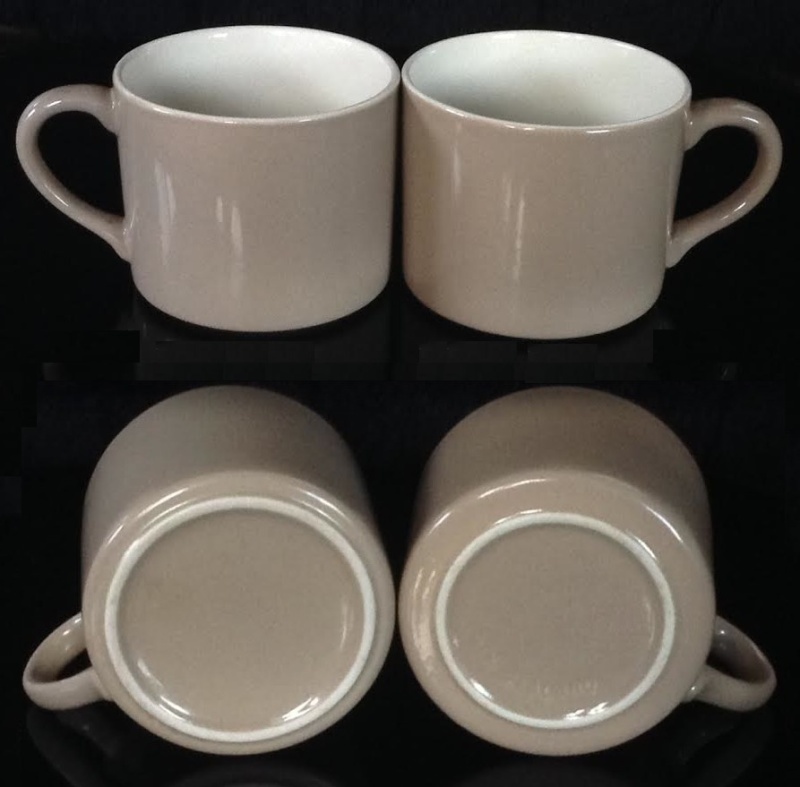 On collecting the trademe box in the evening I was pleasantly surprised at what I found: 8 Carlton cups (shape number 755) in Reflections mushroom glaze, 10 matching Reflections saucers [1, below] and four other Reflections saucers in two different shapes [2 and 3]. Some of these saucers have no backstamps; others are marked "Crown Lynn New Zealand Super Vitrified Ware Reflections pat no 842 9", indicating date of manufacture as 1969. There are two numbers for roll edge coupe saucer in the gallery: 4619 replaced 4615 8/5/69. The 1969 date on these saucers is no help in working out which these are. 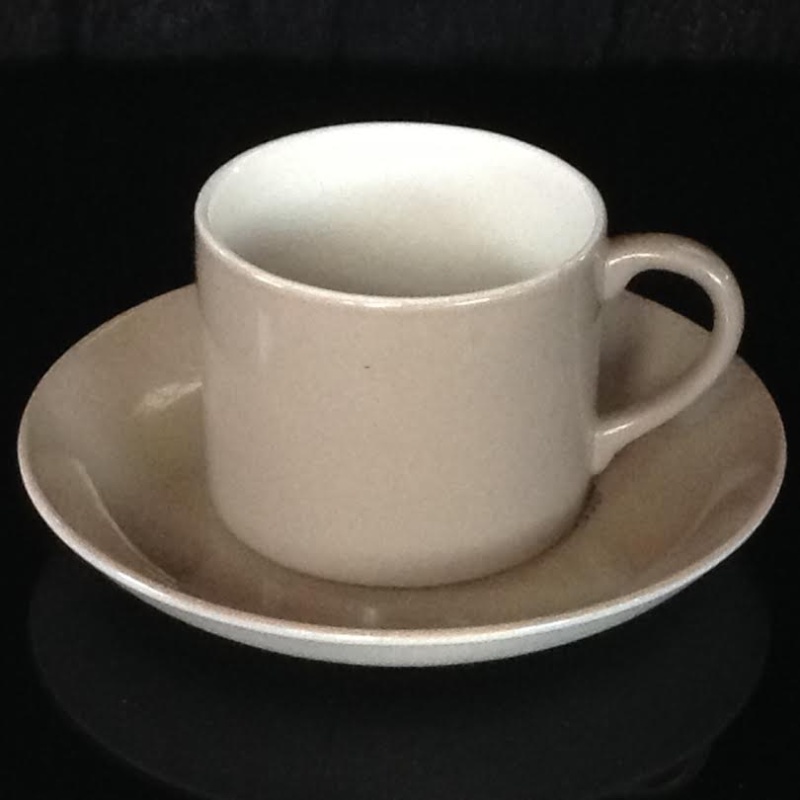 [i have just acquired a Reflections 739 saucer and the Carlton cup looks great on it. [mushroom saucer as Reflections on teal sits on plain teal or teal with white cup well. 2. Although the coffee cans from Habitat (also) sit happily in the heavy saucers (as per the duo I bought from unouwanit, they look better on a distinctly different lightweight saucer which may be a vitrified version of the "jumbo saucer" (as the 739 is the vitrified version of the 805 coupe saucer for the tulip cups). I have three of these, two a bit worn but one perfect, which will be the new display saucer for my original Reflections can. These three saucers are marked "Crown Lynn New Zealand Super Vitrified Ware Reflections pat no 842 9", indicating date of manufacture as 1969. 3. And (this is the big surprise) there was one (only) saucer, slightly worn, in the Cook & Serve shape 792, with a well big enough for the full footring of a 782 can, indicating that there was at one time a 782 Reflections can! Rounding off my set of different Reflections cups and saucers are some photos of previously posted duos. 4. Demitasse 773/734. The vit demi-saucer originally had a plain edge but a roll was added in the mid-late 1950s, at about the same time the handle was beefed up. The replacement shape numbers for the demi-duo (3633/4634) were not used until the late 1970s. This duo definitely has three digit numbers as it dates from between 1959 and 1961. 5. Cook & Serve (supposed) Reflections saucer 792 matched with a tango blue can. 6. Reflections on Teal pat no 755. This is an earthenware duo 781/805, not vit as I had expected. I have two cups and one matched saucer. 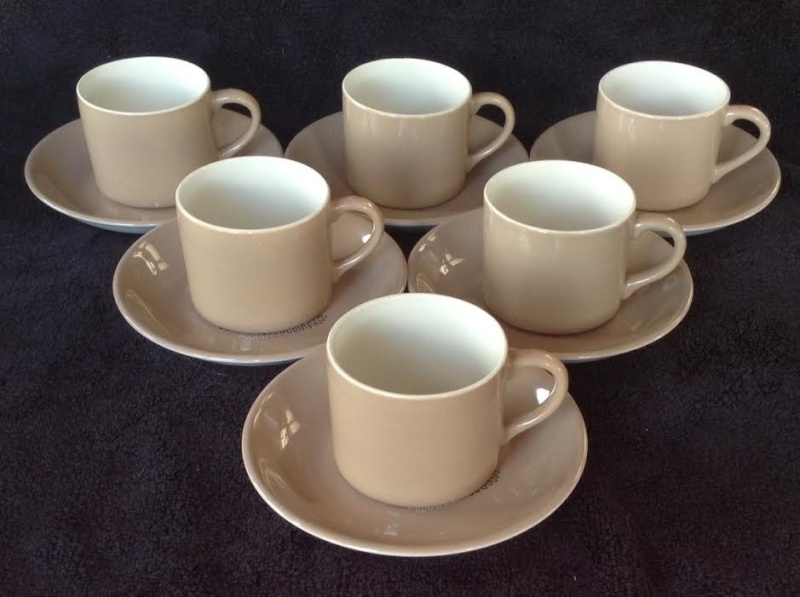 17/6/14 Last week I found a set of six saucers on trademe. I checked to see if they were the right size for the 3618 cans. Bought them! They arrived today. They are all dated 1969. This six set of Reflections d842 3618 coffee can duos is in perfect condition. as the duos would have been sold new. Including the funny one with the tango blue cup I have now identified nine different Reflections duos employing 5 cup shapes, 5 saucer shapes, and 3 pattern variations. *I will have to check the handle some time. Now I have the numbers nearly sorted I see this may be an unlikely pairing of 3- and 4-digit shapes. The 4619 became a multipurpose vitrified saucer as the 739 had before it. The 4619 is a good fit for the 3618 can but the weight balance is wrong (ie the saucer looks too heavy for the cup); it is a better weight balance for the 755 but fit is sloppy. It may be up for argument whether the 4619 was used for both 755 and 3618. I have twice now purchased 3618s on 4619 and have no reason to question the provenance. I have also bought 3618s as duos with 4610?s, and separately. The relative availability of 755 and 4619 being similar suggests their being a match despite the sloppy fit. I have seen other patterned pairings of these two shapes including a six-set in New Vintage pattern. Possibly not a correct pairing but it looks good: 3616 on 739. I now have Reflections on Teal (a pair of cups). Unlike all other Reflections I have seen it is earthenware rather than vitrified. I've just changed the picture above as Jim had a Reflections on Teal saucer which I traded for a teal 739 saucer for his lovely little teal vit tulip (that he had sitting on the Reflections saucer). 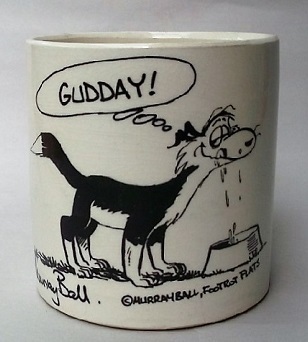 Maybe I should try and track down a Leopard saucer now! It looks as though I may actually have been right in thinking the 3616 was a Reflections cup. The are some listed on tm. Two different saucer types. I've asked the seller to show bases. 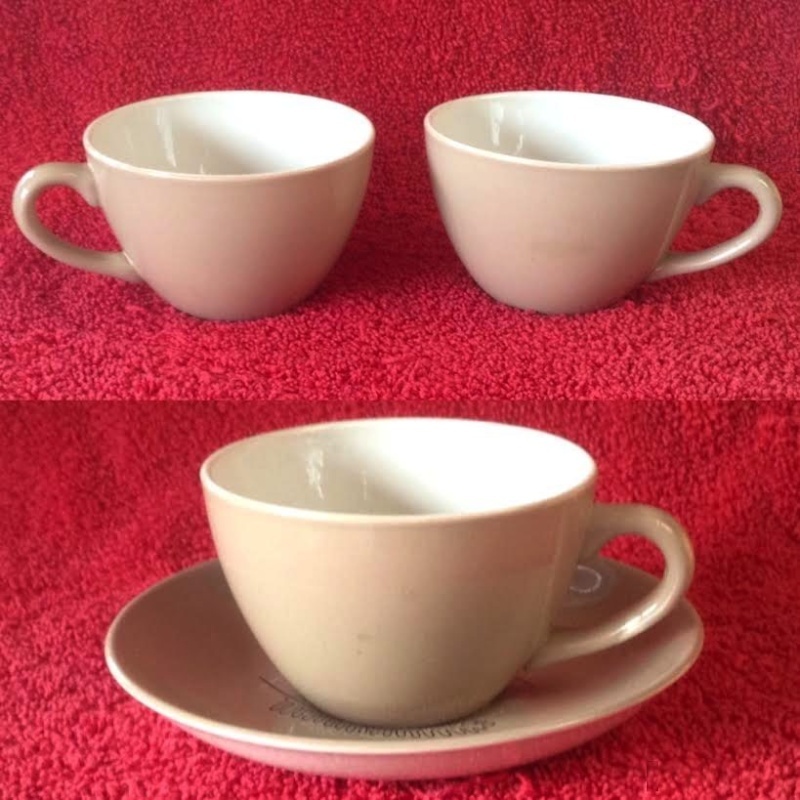 Two of the saucers shown in this listing are the same shape as this duo posted by Val. The 4615 saucer in Reflections is the last piece of this puzzle. As regular forum readers may have noticed, beyond my extensive range of Cook & Serve cans and saucers, I am a collector not of patterns but of shapes. As such I prefer to collect a plain glaze where available but where that option is not available my shapes collection is pretty much a mixed bag. 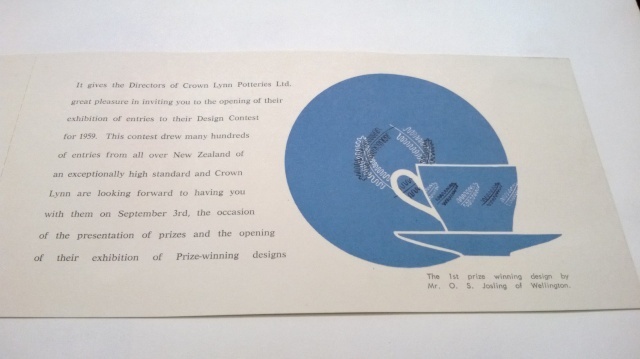 The pattern "Reflections" (d842) by Otway Josling was the first-place winner in the inaugural Crown Lynn Design Awards competition in 1959. As such I saw it as a good starting point for a collection of 1960s vitrified duos. With the acquisition of a Reflections saucer in what I take to be the 4615 shape I believe that collection may now be complete. What more duos could there be from the known shapes? I don't expect to see a 3610 cup in a Reflections duo, for no particular reason other than I don't think it would look good (but who knows). Nor do I think the stacking hotel cups and saucers (3622/3644/4624) would have used Reflections as they were released in 1973, by which time I believe Reflections had run its course. There may be other cup shapes that I could add, if they indeed exist in the mushroom-coloured Reflections glaze. Those are the vitrified tulip 863 and the vitrified breakfast cup 3613 (vitrified jumbo cup), both of which I have Reflections-patterned saucers to match. Both cups are now very rare shapes. We do have a few examples of the 863 on the forum, but my plum-coloured 3613 is the only cup in that shape that I have ever seen. The tulip sits on a 739 saucer which I have in Reflections pattern as part of a duo with the 755 Carlton cup, later (as others too) to sit on the ubiquitous 4619 saucer, which was introduced in 1969. The 3613 would sit on a vitrified jumbo saucer, which shape I now believe to be the 4610: I have that saucer which was the initial match for the 3618 "altered base 782" coffee can, before that shape too was re-paired with the 4619 saucer. Ev has said that she has a memory of seeing a mushroom-coloured Reflections tulip duo, like the otherwise unique earthenware "Reflections on Teal" (pat no 755) duo adopted in 1964 by TEAL (before the national air carrier became Air New Zealand). 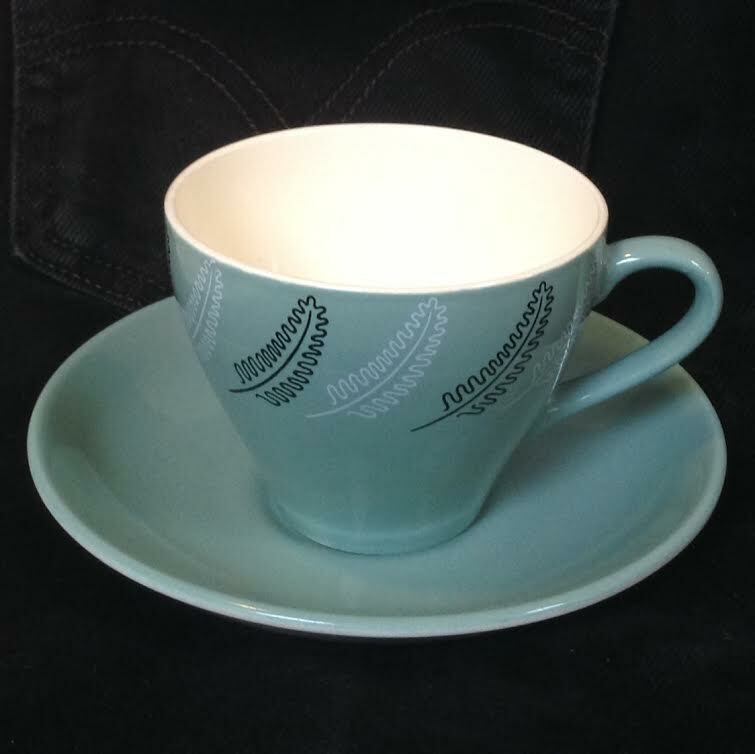 Reflections on Teal is a variation on Josling's award winning pattern, and the only known version of Reflections to carry the fern leaf pattern on cup rather than saucer. 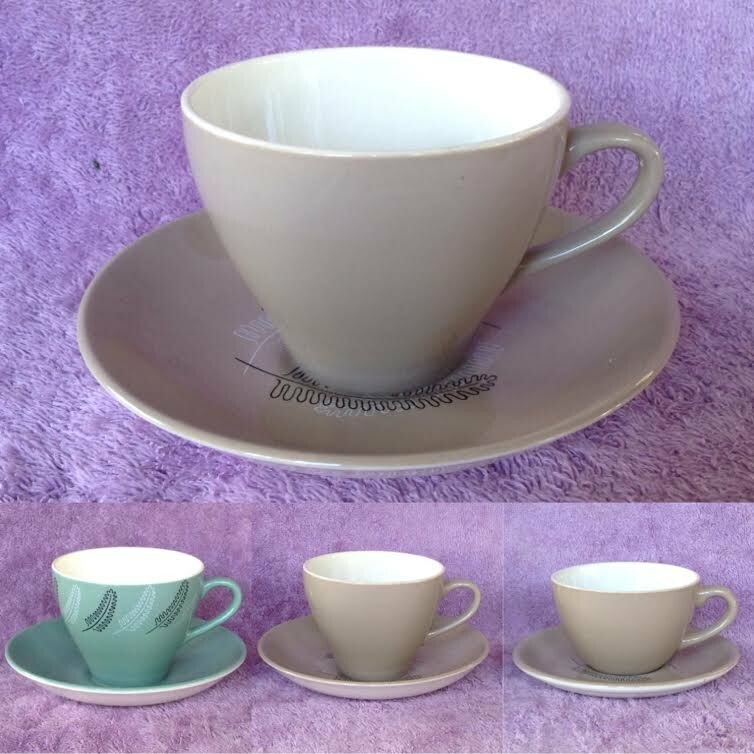 I wonder if perhaps the mushroom-coloured tulip shape was actually the low "tulip" shape 3616 (a 783 Air New Zealand cup with a handle like a tulip cup) which I had previously paired, for lack of a suitable alternative, with a 739 saucer. One other report of a mushroom Reflections tulip turned out to be a dead end. My recent find, which I am so thrilled about, as it appears to complete this collection, is the correct saucer match for the 3616 cup (as we have seen from Val's duo in the Riviera pattern d956), one I believe to be a 4615. Last week's rather expensive trademe purchase and this week's pickup was four duos, two with the "4615" saucer, and two with its replacement, the aforementioned, ubiquitous, 4619. My choice of Josling's Reflection pattern for this vitrified-cup-and-saucer shape collection was a lucky one, as it is the only pattern yet seen in the 3618 cup and 4610 [?] saucer shapes (of which I now have a complete six-set) and, excitingly (for a collector of those coffee can duos), on a single 782/792 duo bearing a standard Crown Lynn base stamp (on saucer), something not seen on any other 782/792 duo, of which I have hundreds. Another rare 792 saucer with a third variation of the Reflections pattern may or may not have originally had a tango blue can on top, but until I know better it stays. I do not anticipate any further Reflections duo shapes appearing so I consider this collection now complete, but who knows: we have yet to identify shapes to match the likely pairing of 745 "small hotel cup vit" and 743 "hotel saucer". I suspect the latter shape may also be the saucer for the 783 Air New Zealand cup, and duos in the red and blue tango patterns for THC. 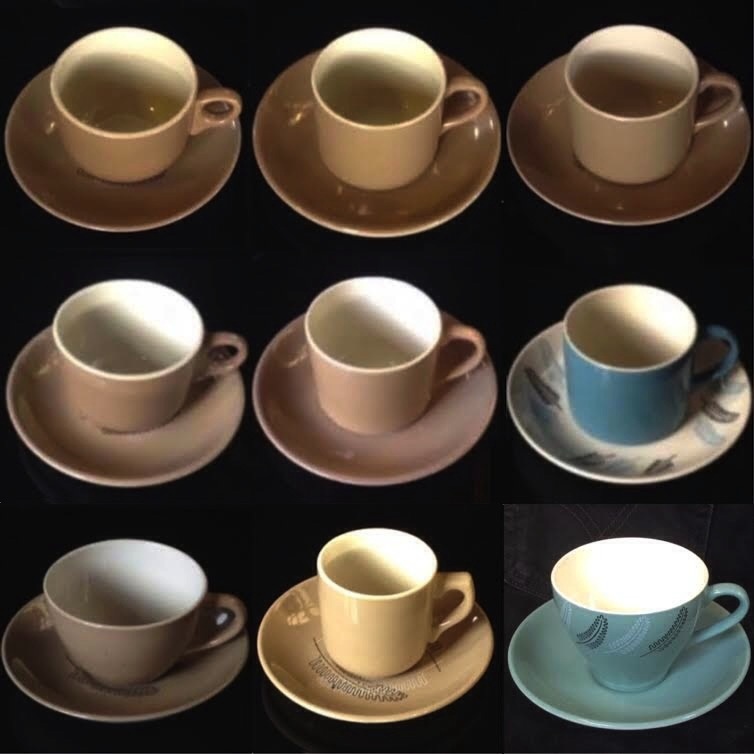 Beyond a plain clear glaze I cannot think any other Crown Lynn pattern that covers such an extensive range of vitrified cup and saucer shapes as those I have collected in Otway Josling's Reflections. I lose track of the exact number but I recall something like six different cups and seven saucers with (taking into account saucer changes over time) ten or eleven different legitimate combinations. End Note. A suitable accompaniment to this set, which of course I am always on the lookout for, would be a tulip duo in the similar Leopard Breweries pattern of black-fern-on-teal-colour-glaze, perhaps conceived as a variation on the "Reflections on Teal" pattern. Reflections Tulips: was I too quick to dismiss this vitrified duo? This duo is the correct cup and saucer shape match: 863/739. The cup is Reflections mushroom colour and its base is impressed "New Zealand". The saucer is Reflections (pat. 842) and has a black crown and star vitrified stamp. In my previous post I said I thought it unlikely then within three days I had one. It looks good as the pattern is all correct, as is the shapes combination. Certainly it is not a match for the earthenware Reflections (754) in the way the pattern is arranged, but it is the same as all 842 duos. Question: I'm wondering about the orders of the pattern numbers as numerically the Reflections on Teal (754) appears to precede the mushroom Reflections (842). I would expect the mushroom pattern to have a smaller number than the teal as I thought it was an earlier design. Then again, I note that the number 842 does not appear on any pieces before the use of the supervitrified backstamp in 1969 and Reflections on Teal is 1964. Could there be another (earlier) pattern number for mushroom Reflections? There is something in the musuem notes about "reflections on mushroom Vit" and of course it will be dated. - I remember last year or even prior to that? I was looking into what the original colours were dates etc... and found that 1959 it was the teal colour EW as Ev has pointed out and later the mushroom vitrified. The date have escaped me! Another day at the musuem? It's nice of you to take the time to wade through my verbiage. 2. A big YES to the tulip duo I just posted. The b&w photo shows, bottom left, what looks (from the edge of photo distortion) like a 750 cup but being vitrified it must be the 863/739 tulip duo. Ev, this must surely be the tulip you remember seeing in Reflections mushroom. I see also top right of same photo a 782/792 duo. As this is 1966 it cannot be the 3618/4610 duo as the 3618 can is dated 1968. I have only ever seen the one duo that I can be sure is the same combo and that is the one I pieced together. As a rule, before 1969 Reflections on mushroom has a plain black crown and star vitrified stamp. In 1969 the supervitrified stamp appeared, complete with date. Every piece I have with that stamp is dated 1969. That is, two of the three four-digit saucers, 4610 (jumbo vit), and 4619 (roll edge saucer with integral footring, ie hollow bottom like a plate). My two 4615 (roll edge, wide footring like a 792 Cook&Serve saucer) Reflections saucers have the vitrified stamp, so they date from early than 1969. I have other 4615s (not Reflections) with crown and date green vit stamp, 1968, and green supervit stamp, 1969 and 1970. As all my Reflections pieces prior to 1969 have the same stamp, with star not date number, I simply do not know whether EITHER the stamp for Reflections remained the same even when other patterns had dated vit stamps OR all the stamps, thus the pieces, are earlier than 1968 (or whenever dating started, which I have looked into but need to go back to some time). This now confirms all my duos (setting aside the unnamed blue, black, and white Cook&Serve saucer duo), except the 755/739. The 739 (vit 805) saucer WAS used for 755 cups, Janice has noted a reference to them on 4615s, but mine generally have come with 4619s. 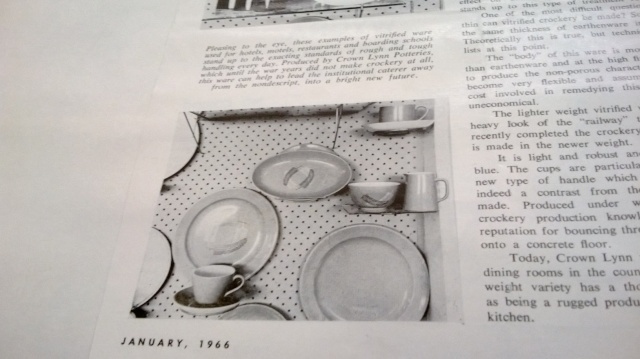 If the 1966 photo above is the release of Reflections on Mushroom, then, if the 755 was part of that initial release, EITHER the Reflections 755 would have been on a 739 OR a 4615, of which the earliest dated example I have (seen) SO FAR is 1968. BUT, We have nothing so far to say that 755s were part of that initial release. It is looking like a much shorter run for Reflections on mushroom than I had anticipated, 1966 to 1973. Using this new info I will hopefully be able to put my collection in approximate chronological order. Just one more possible duo now, the vit Fathers cup, and I remain sceptical but open to being surprised. Reflections on Hotel Staccking ??? Ev, is there any indication what shape the 1973 Reflections was made in. I will check it out tomorrow Jeremy. In the later 1960's I worked in a restaurant that used Reflection on Mushroom and there was a wall of cups all stacked up enough for at least 100 people, so it makes sense to me that the cups were the stacking type. The vitrified plain Mushroom has the Deco Number 00013, which I will have to check out sometime too in case there are any shape numbers. The 868 is odd as the numbers after it suggest it is plate but 868 in the gallery is the lidded ramekin, which came out with the first issue of Cook & Serve, thus we have them in H/P Blue Tango, Vision and (I think) Narvik. The timing is wrong for RoM by a few years, but then again there are some in replacement patterns too so why not. 3615 might be helpful sometime if one appears as that shape is not in the gallery. 4610 is good for me as it helps my argument for jumbo vit saucer being that shape. The jumbo vit is the second most common RoM saucer I have encountered after the 4619. Fits the modified base coffee can(, and the vit jumbo tulip). I don't really want to have to buy a stack of cups in the hope of one day finding a single saucer. I already gave a ton of stacking cups and saucers in Pioneer that I no longer have need for and I don't think they would sell for much. I'll ponder that one. I would like to find a single 3624/4624 duo for my Reflections duos collection as, apart from the TEAL duo (like Air NZ Tahora), it must be about the only thing missing now. Looking at the duos in the auction I thought something was not right: the way a 3624 (double-footring stacking cup) sits in a 4624 you should not be able to see the cup-well. I asked seller for a pic of the saucer underside and it turns out to be the ubiquitous 4619, as I was expecting. Seller says one saucer is thinner so I'm guessing 4610. So, while I have seen the mushroom 3624 cups a number of times I have yet to see a 4624 saucer with Reflections decals. I'm left wondering if they actually exist. If anyone spots a 4624 hotel stacking saucer (very similar to Forma saucer but vitrified) with Reflections transfers please let me know.